For labor analgesia are used different medicamental and non-drug methods. General anesthesia. In the application of these types of anesthesia is lost pain sensitivity all parts of the body. Along with the loss of pain sensitivity in the general anesthesia medications also affect the consciousness. Endotracheal anesthesia. Is performed general anesthesia with mechanical ventilation. The method provides a long-lasting effect. In this case is used the whole combination of drugs and anesthetic enters into the lungs through the trachea. This anesthesia is used for caesarean section, in case of emergency. Inhalation (using the mask) anesthesia. One form of pain relief is an inhalation anesthetic - nitrous oxide, which a woman in labor inhales through a mask resembling a respirator. The mask used during the first stage of labor, when there is an opening of the cervix. Local anesthesia. In the application of local anesthesia, pain sensitivity are deprived only certain parts of the body. This method is often used after childbirth for analgesia during suturing of the soft tissues. 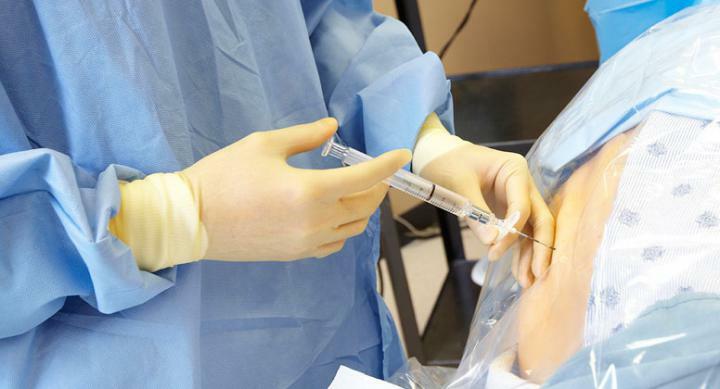 This anesthetic is injected directly into the place of surgery. Epidural anesthesia. 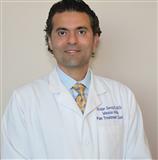 One form of local anesthetic, is provided by the introduction of local anesthetic in space over the hard shell of the spinal cord. This anesthesia often used in childbirth. After the injection becomes insensitive the lower body. The nerves by which in a brain from the uterus and cervix are served signals of pain, pass through the lower part of the spine - and here injected anesthetic. During action of of this kind of anesthesia woman is fully conscious and able to talk with others. Intravenous anesthesia. The drug (anesthetic) is introduced into the vein. A woman in this case falls asleep for a short time (10-20 minutes). It is used for short-term performing surgical procedures during childbirth, such as when allocating parts of the placenta, imposing forceps. The use of narcotic analgesics. Narcotic analgesics are administered intramuscularly or intravenously, reduced sensitivity to pain during childbirth, a woman is able to relax in the intervals between contractions. the need for surgical intervention during delivery - forceps delivery, manual removal of the placenta. In these situations often use intravenous anesthesia. The same method is used immediately after birth at the time of recovery of the birth canal. Analgesic massage - exposure at certain points in which on the body surface out nerves. The impact on these nerves causes some soreness and thus distract from a pain. Classic relaxing massage - stroking the back, neck area. This massage is used both during contractions and in between them. Relaxation - relaxation techniques that help to easier to endure the contractions and fully relax in the periods between them. Breathing exercises - help to easier to endure the contractions. With skillful use of the right type of breathing during contractions we achieve easy, pleasant dizziness. It was at this moment occurs the release of endorphins (these hormones are produced in large quantities during childbirth; endorphins possess analgesic and tonic effect). Active behavior during childbirth - well, if the expectant mother knows that during normal, uncomplicated delivery can take various positions and choose the most convenient, where she is easier to tolerate contractions. Active behavior also is the movement, walking, rocking, tilting and various postures, to relieve the spine. Change of position - the first and most natural desire at any discomfort. Hydrotherapy - use of water for pain relief of contractions. In different situations during contractions anyhow, you can use a bath or shower. Electroanalgesia - the use of an electric current for influencing on biologically active points, that also helps to ease the pain. To take advantage of non-drug methods of pain relief, you need to know about these methods, to possess practical skills. Course of psychoprophylactic preparation for childbirth can be learned in the antenatal clinic or school for pregnant women, in which will teach proper breathing during childbirth, show rational postures, help to learn relaxation techniques. When medicamental anesthesia anesthesiologist preliminary talking with the woman about the essence of the method which is planned to use, as well as its possible negative consequences. Must say that in emergency situations, when the woman's life or the child is in serious danger of this procedure is neglected.